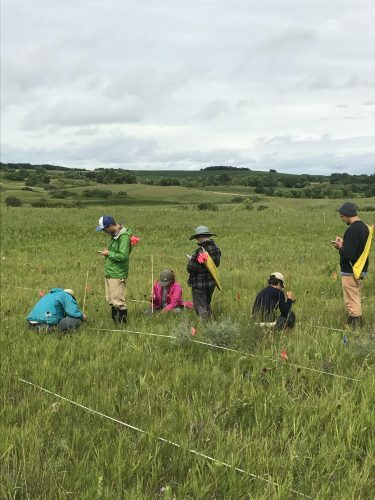 This summer, we measured open-pollinated hybrid Echinacea plants in experimental plot 9 at Hegg Lake. 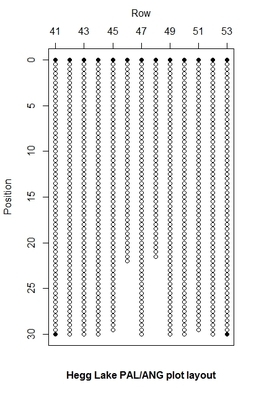 The table below shows the number of plants found alive during each search since the experiment started in 2014. Of the surviving plants in 2017, 90% had fewer than 3 leaves, the mean length of the longest basal leaf was 25 cm, and only six plants had more than one basal rosette. This year we searched for plants once then rechecked every position where we didn’t find a plant during our first search. No plants flowered this year. This experiment comparing the fitness of Echinacea hybrids with pure-bred E. angustifolia and E. pallida will give insight into the possible consequences of non-native E. pallida being planted in restorations in Minnesota, where E. angustifolia is the only native Echinacea. Data collected: Rosette number, length of all leaves, herbivory for each plant collected electronically and exported to CGData. Recheck information for plants not found was also collected electronically and stored in CGData. You can find out more information about experimental plot 9 and flog posts mentioning the experiment on the background page for the experiment. The team after an initial measurement of p9. 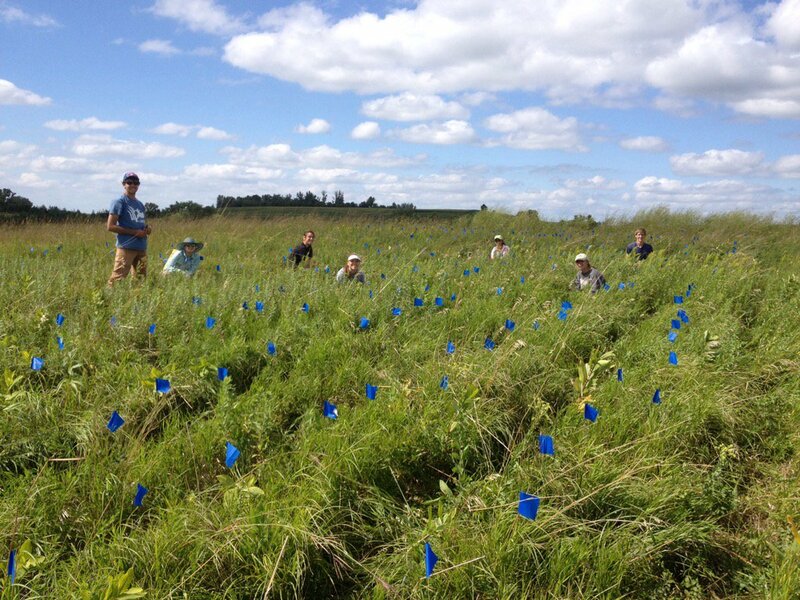 Blue flags are positions where Echinacea weren’t found. 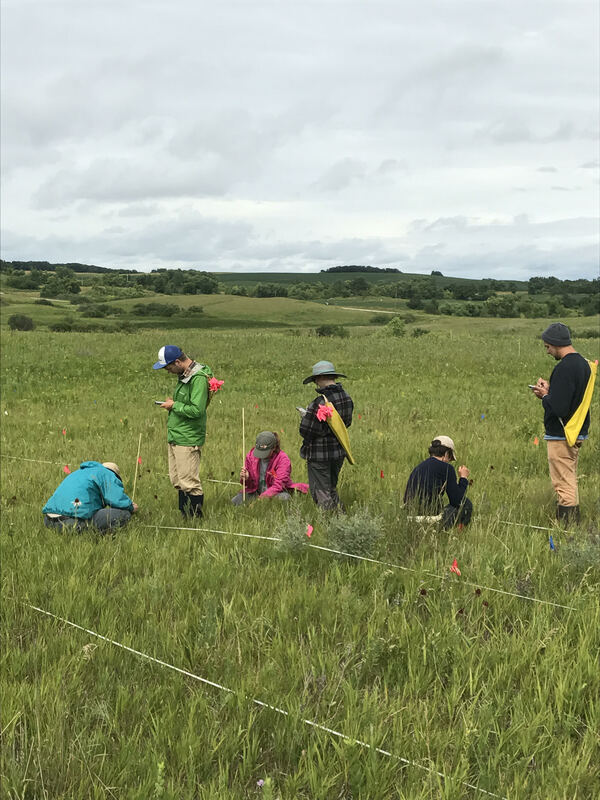 This summer, we remeasured plants in experimental plot 9 at Hegg Lake. These plants are hybrids of Echinacea angustifolia (native) and Echinacea pallida (non-native, but planted at a nearby restoration). Unlike the plants in p7, these plants came from open-pollinated parents – that is, there was no artificial crossing done. Stuart and Lydia English planted the seeds in May of 2014. Much like with plot p7, an analysis the survival and fitness of these plants can give insight into whether or not hybrid populations can be viable in our study areas, and whether or not they pose a threat to native E. angustifolia in our remnants. We have returned to the plot each of the last three years to measure number of rosettes and leaf lengths of these plants. Table 1 shows the number of plants found alive during each search. These plants were measured on August 4th and rechecked on August 23rd. No plants flowered this year, although there were several found that had leaves over 40cm long. 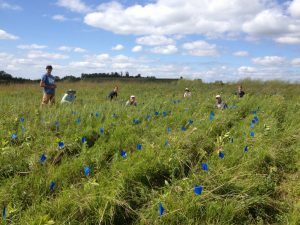 In 2015, we continued an experiment that investigates hybridization between the native Echinacea angustifolia and the unintentionally planted non-native E. pallida. This year, out the the 758 plants planted in spring 2014, 521 were still alive which is a survival rate of 68.7%. In the late summer of 2013, members of Team Echinacea collected heads from Echinacea angustifolia and Echinacea pallida from two nearby populations at Hegg Lake Wildlife Management Area. Unlike previous experiments, we performed no artificial crosses. This allows us to determine if hybridization is occurring naturally. In the winter of 2014, Lydia English germinated seeds from these heads. In the spring, Lydia and Stuart planted 758 seedlings at Hegg Lake WMA near experimental plot 7. We took fitness measurements, such as number of rosettes and leaf lengths, this year. In addition to the experimental plot, we collected heads and tissue samples from 28 E. angustifolia that were near the restoration with E. pallida. We have not yet done any analysis on these plants but we are hoping to determine if hybridization in continuing. Davis Blasini was awarded the best undergraduate student poster in 2014 by the Ecology Section of the Botanical Society of America: “Introduction of Echinacea pallida in the Prairies of Western Minnesota and its Possible Effects on Native Echinacea angustifolia” Co-author: Stuart Wagenius. Now if you can’t already tell, these are not the achenes you may be used to seeing. These are all achenes from Echinacea pallida, a purple cone flower species not native to Minnesota but planted in some restorations within our field site. These specific achenes come from Hegg Lake, and they are some of the same achenes that Grace and Aaron, our interns from December, weighed and x-rayed in their analysis modeling hybridization between E. angustifolia and E. pallida. We are going to germinate and grow up some of these plants to see if hybridization is occurring in nature. Nicolas and Shona demonstrated hybridization between ANG and PAL was possible and viable through their artificial crosses, Dayvis concluded that the two species have overlapping flowering phenologies and pollinator assemblages, and Grace and Aaron modeled seed set of PAL and ANG heads collected this year and concluded that the model that best explains their data is one where the two species interbreed. So do they?!?!? We’ll let you know. Check out the awesome final report that Aaron and Grace wrote about their work during their December internship. It details how they modeled hybridization between E. angustifolia and E. pallida from Hegg Lake. Cool stuff! Happy 2014 everyone! 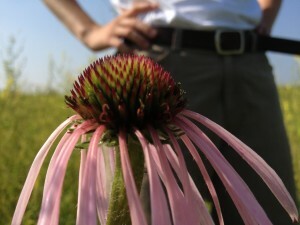 Here’s the latest news from The Echinacea Project. Grace and Aaron, two students from Carleton who spent their winter breaks in the lab, finished up their internship on Friday. They did some great work with the E. angustifolia and E. pallida heads we collected from Hegg Lake. If you recall from the summer, Dayvis looked at the flowering phenology and pollinator assemblages of these plants. 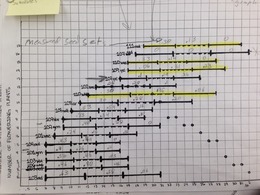 In short, Grace and Aaron followed up on Dayvis’ work by examining seed set (via x-ray AND weigh machine!) of the top, middle, and bottoms of each head. They were interested in determining the likelihood of hybrization occuring naturally between pallida and angustifolia and modeled this likelihood with the Dayvis’ phenology data from this summer. They created some beautiful, hand-drawn flowering schedules (shown below) and they’re working on finishing a report that we will post soon. Above: flowering schedule with pallida heads shown is blue and angustifolia shown in red. Below: flowering schedule with seed set of each section of each head written in pencil. 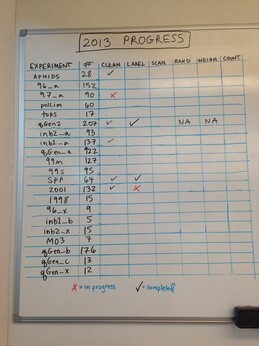 We’re now tracking the progress of our 2013 heads with this handy-dandy white board chart. On the left we have all our experiments in the common garden and the number of heads in each experiment. 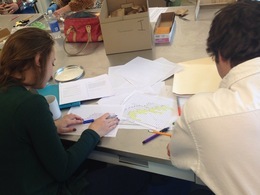 The chart may look mostly empty, but that doesn’t mean our volunteers aren’t hard at work! We had people come in on Christmas Eve and New Years Eve! What dedication! 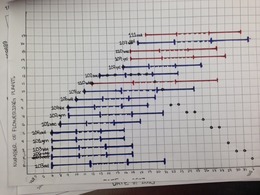 We will keep you updated as this chart begins to fill up! We hope everyone had a good Thanksgiving and is embracing the cold weather and snow! A couple big things have happened in the lab over the last few weeks. We have two interns, Grace and Aaron, from Carleton College who are working in the lab during their winter break.Their main project has been deciding how to proceed with the Echinacea pallida and E. angustifolia heads we harvested from Hegg Lake this fall. Dayvis observed pollinators and took phenology data on these heads during the summer for his REU project and now we’re interested in seeing if these two species have actually hybridized in nature. Grace and Aaron are currently working on making flowering schedules for the heads we collected. Stuart heard back from the NSF with good news! They’re funding the proposal he submitted this summer! With this grant money he plans to examine constraints on reproductive fitness of Echinacea in remnants by combining data on spatial isolation, flowering phenology, and mating compatibility. Really cool stuff! Other than that, it’s business as usual here at the Chicago Botanic Garden. 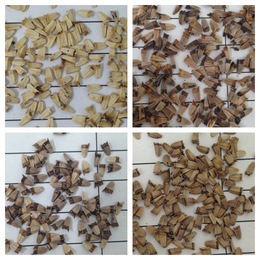 Our volunteers have been working hard cleaning heads and counting seeds. We’re definitely making headway on this year’s harvest!